We've talked about Emperador Dark here on Slab Sunday, and today we're going to talk about the....should we call it cousin?, Emperador Light marble. Emperador Light marble is quarried from a bedrock quarry near Bursa, Turkey. A lot of people think it's quarried from the same quarry as it's cousin Emperador Dark marble, but Emperador Dark is actually quarried in Spain. In this photo below, the Emperador Light is the accent tile on the floor. It looks great paired with the Crema Marfil marble on the floor and countertop. Emperador Light is also called Light Emperador. It's kind of hard to see, but this beautiful fireplace has Emperador Light on the face and hearth. 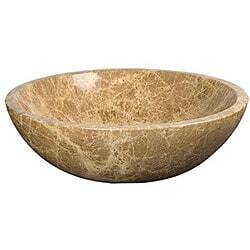 Emperador Light is a very popular stone for vessel sinks. My advice when buying a beautiful sink like the two below is to make sure your countertop is simple. You don't want them to fight. I'd suggest Crema Marfil marble, Durango travertine, or even Emperador Dark marble if it's a dark slab that doesn't have too much going on. I've always loved Emprador Light. It's such a beautiful marble. I actually have it in my master bath! Very pretty marble. I've never seen it before, but I really like it. Any problems with etching? It doesn't sound like you have any regrets. Kim- I think it's beautiful as well. Glad you saw something new today! Love those last two vanities. It's a gorgeous marble.